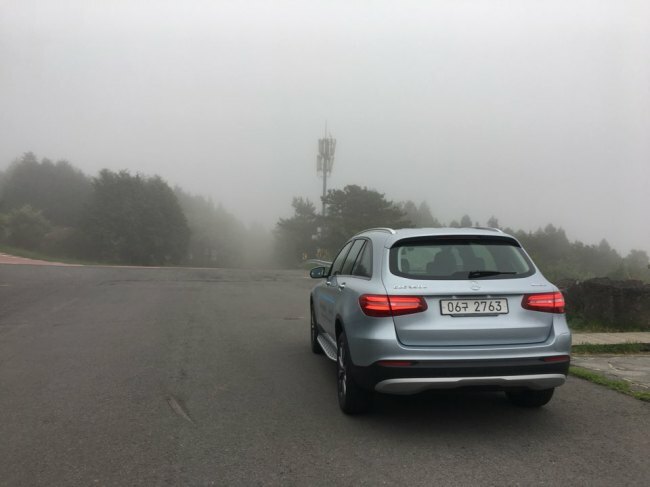 SEOGWIPO, Jeju -- The New GLC 350 e 4MATIC, the first Mercedes-Benz SUV under the EQ brand, has landed in Korea aiming to get a foothold in the market’s fast-growing green sector. Despite its green ambition, the plug-in hybrid SUV disappoints in regard to its driving range of a maximum of 15 kilometers on pure electric power. However, what the vehicle really wants to prove is its performance, rather than its greenness, through the latest hybrid technology that completes its dynamic yet reliable driving. Driving through the hilly road on the nation’s venerated mountain Hallasan was an eerie experience, not just because the misty weather blocked my view, but also the vehicle itself was really quiet. But less than 10 kilometers of driving, the numbers at the monitor said there was less than 20 percent of electric power remaining. The gasoline engines are back, as the New GLC quickly shifts to hybrid mode. In use of EQ Power, the brand name for the German carmaker’s latest plug-in hybrid, the vehicle is operated by a combination of an electric motor and a gasoline engine that complement each other from time to time. The vehicle also offers dramatic acceleration called the Boost Effect by combining power from the electric motor to the gasoline engine, adding a sportier feeling. The new GLC can produce 211 horse power with 35.7 kg.m of torque on gasoline engine power, while the electric motor generates 116 horse power with 34.7 kg.m of torque. On electric mode, its maximum speed is at 140 kilometer per hour. It’s fast, dynamic but is really smooth. And that explains why this vehicle is already popular among female drivers. The mid-size SUV is quite big and masculine, a remainder of Hyundai’s first generation Santa Fe. But its steering wheel is light and easy to maneuver, even in a situation like climbing the one-way Hallasan mountain road. The highlight of the vehicle is when climbing down, watching the battery be recharged by the inertia force. Well, the brief test driving session in Jeju was all about climbing the mountain. But the impression of the vehicle was that it could be more adaptable for urban driving and could be appealing to the 30-something and 40-something SUV-loving female audience who wants to experience comfortable driving and stay stylish at the same time. But the New GLC has its weakness where engineers might have not thought of. The height of the trunk door when it’s open is high, making the average Korean woman almost jump from the ground to click the button to close. And remember, it takes 4 hours to drive probably less than 15 kilometers on pure electricity. It is not really about being green. The New GLC 350 e 4MATIC is offered at 67.9 million won ($63,230) and 75.9 million for premium version.